Next week our associate artist Isabelle Cressy takes the next brave steps together with partner in crime Hannah Kew to show the developments of their piece “What are you trying to say?”. You might remember this piece which had it’s first work-in-progress showing -making audiences fold double in laughter – in our Autumn Platform 2012. “PINCH will be performing a piece we have made as part of, and with support from Bristol Old Vic’s Ferment Programme on July 19th at 8.15pm. 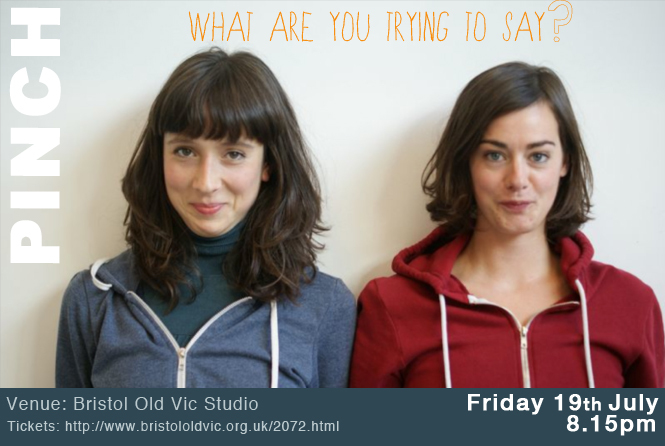 It’s called ‘What Are You Trying to Say?’ and we would really love you to come, enjoy and share your thoughts with us. We are an excited collaborative pair – and are eager to continue working together, so this could well be the start of something beautiful…hopefully with more things to come. At Ausform we are mega chuffed about this work continuing it’s life and encourage you all to go see, so see you there!